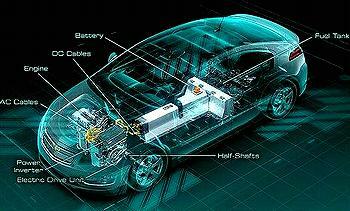 WASHINGTON, DC, August 7, 2012 (ENS) – Nine experimental electric vehicle battery projects have been chosen for investment by the U.S. Department of Energy through its Advanced Research Projects Agency-Energy (ARPA-E). “This latest round of ARPA-E projects seek to address the remaining challenges in energy storage technologies, which could revolutionize the way Americans store and use energy in electric vehicles,” said Secretary of Energy Steven Chu, on Thursday when the selected projects were announced. The selected projects will be awarded a total of nearly $20 million to focus on innovations in battery management and storage that will advance electric vehicle technologies. GE Global Research in Niskayuna, New York will receive $3.12 million to develop thin-film sensors that enable real-time, two-dimensional mapping of temperature and surface pressure for each cell within a battery pack. These new sensors will provide higher resolution compared to today’s thermal sensors, improving internal battery measurement capabilities and lowering the cost of electric vehicles. Ford Motor Co. expects to receive $3.1 to develop a high-precision battery testing device to improve battery-life forecasting and validation. This project aims to reduce the time and expense required in the research, development and qualification testing of new automotive and stationary batteries. Robert Bosch LLC of Palo Alto, California will get $3.1 million to develop battery monitoring and control software to improve the energy utilization, reliability, and charge rate of electric vehicle batteries. Bosch’s advanced battery management system will leverage breakthroughs in real-time modeling of the battery’s internal environment. Utah State University will be awarded $3.07 million for its project on cell-level power management of large battery packs. Utah State scientists will develop electronic hardware and control software to create an advanced battery management system that actively maximizes the performance of each cell in a battery pack. This cell-level battery management system could reduce the cost of electric vehicle battery packs by or more. The Eaton Corporation of Southfield, Michigan will receive $2.48 million to develop a power control system to optimize the operation of commercial-scale hybrid electric vehicles. Eaton’s approach reduces the size of the battery needed for operating large hybrid electric vehicles with no loss in battery life or vehicle performance, enabling a more cost-effective solution for commercial vehicles. Pellion Technologies in Cambridge, Massachusetts will get $2.5 million to develop a rechargeable battery for electric vehicles that has the potential to travel three times the distance of today’s lithium-ion car batteries. The Pellion batteries will be fabricated from abundant, low-cost metals that can be sourced from within the United States. If successful, this technology could revolutionize the distance electric vehicles can travel on a single charge. Sila Nanotechnologies of Atlanta, Georgia will be awarded $1.7 million to develop an electric vehicle battery that doubles the capacity of today’s lithium-ion batteries. This technology uses low cost nano-composite materials that could cut energy storage cost in half or more. This cost reduction could accelerate electric vehicle adoption and decrease range anxiety that keeps drivers from buying today’s electric vehicles. Xilectric, Inc. of Auburndale, Massachusetts will receive $1.7 million to reinvent Thomas Edison’s battery chemistries for today’s electric vehicles. This reinvented battery will cost less than the battery that starts today’s gas powered cars. It uses an innovative chemistry based on domestically available aluminum and magnesium and simple construction to increase performance and lower cost. And finally, Pennsylvania State University will get $1 million to develop an innovative design for electric vehicle battery packs that can reroute power in real-time between cells. Compared to today’s electric vehicle battery packs, this reconfigurable battery architecture will enhance battery safety and performance. The Department of Energy says these projects have been selected for negotiation of awards; final award amounts may vary.